Ah, the feeling of being gubbed is definitely a strange one. For months, or even years, you’re able to exploit a bookmaker through matched betting. What Does ‘Getting Gubbed’ Mean? If you’ve been gubbed, you’ll probably have an email from the bookmaker telling you so. They won’t use the word ‘gubbed’ in their email, however, as this is matched betting jargon that means ‘to be banned from promotions’. There are variations on the word often thrown around too – grubbed, garbed and more – but the unofficial term is ‘gubbed’. This means – and it will say this in your email – that traders at the bookmaker have decided your account is not profitable enough for them (because you’re exploiting their offers) and therefore they’re removing you the right to receiving free bets. They’ll say something like “we didn’t take this decision lightly” but they did, you were flagged on their account and they swooped in for the kill – just as you would if you were in their position. Despite the fact you are well aware that you’ve been exploiting them, you’ll likely still be angry with the bookmaker for doing so. It happens to all of us – it’s a funny old game. In short; being gubbed means a bookmaker has removed your right to free bets and promotions, and they may have also applied stake restrictions to your account. Read on to find out why this happens & how to avoid it. Why Have I Been Gubbed? It always hurts to be gubbed, especially if you’ve been had by one of the big boys in the market: William Hill, Bet365, Paddy Power etc. 1) The only bets you ever place with a bookie are on their free bet offers, or on their price boosts. This is a telltale sign for a bookie that you are a matched bettor. Don’t give the game away by making it blatantly obvious that you’re only using them for their offers. Place varied mug bets regularly on high profile events. 2) You’re taking too much value. Because you’re likely using OddsMonkey’s oddsmatching software, it’s easy for you to get a close match between your back and lay odds. If you’re getting an extremely close match, or even placing arbitrage bets, you’re likely to get gubbed. Bookies can’t make money if you’re taking value from them. If you leave some value to them, and keep some for yourself, you can both win in the matched betting environment (and make your profit from the betting exchange). There are of course things slightly different to these, but these are the main two culprits. Most bookies will grade your account on how ‘profitable’ it is for them. A bookie doesn’t judge how profitable you are by how much you win or lose. It judges you by how much value you’re seen to be taking. If you’re multi-accounting, also known as gnoming, you will be flagged up by the bookmakers. Ensure you only ever run accounts in your own name. Do not ask us for advice in this area as we will not respond. There are instances where account restrictions have been lifted and you are able to receive promotions again. This depends on the bookmaker you’re using, and the type of gubbing you have received. The vast majority of gubbings restrict you from receiving free bets. Some, however, restrict your stake to very small levels. If you’ve been stake restricted, it’s very hard to get your penalty lifted. The best thing to do in this instance is to wait a month or two, then come back to the account and see if you can place stakes of any level. Even if it’s £5 or £10, you could begin placing mug bets to try and get your account back into good standing. If you’re not stake restricted but simply banned from receiving promotions, then now is your chance to mug bet for a while. Try to place at least a few mug bets a week, using advanced mug betting strategies, to try and show the traders at the bookmaker that you were actually a loyal customer all along – and not a matched bettor. If you’re a good enough mug bettor, you won’t get gubbed. A good mug bettor is someone that bets on a range of different high profile events regularly, mixes up their stakes, varies how they bet, the types of bet they’re doing and more. If you stick to smart mugging, you’ll almost certainly avoid gubbings and keep your accounts healthy for years to come. If you don’t take the p*** with a bookie, you’ll be fine. Give back little and often and you’ll be rewarded for it – both short and long term. 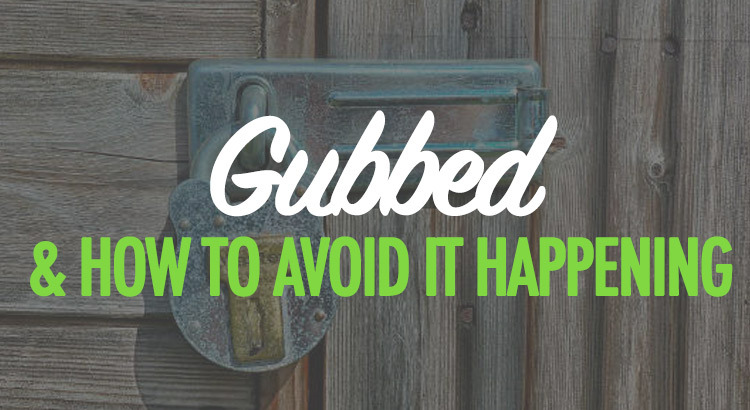 Thanks for your advice on avoiding gubbing – I found it most helpful. I originally made a steady profit from Bonus Bagging but my bets came to an end, as I used up the new customer offers. I’m now with Odds Monkey and have found some new sign up offers to take up. I’m finding reloads more of a challenge! I paid £40 into my Coral account after it had been inactive for more than a year. I was attracted by in play Premier League Bets which gave a free bet if the qualifying bet lost. I did 3 – and was gubbed! The really annoying thing was that Coral didn’t tell me, – I only found out when I enquired why i hadn’t got my free bets. They were stroppy about it when I complained, – said their terms and conditions didn’t require them to tell me! I’ll take this as a warning! There are people on Odds Monkey Community who say they have been gubbed by 4 or 5 big bookies. I was taken aback to see your advice to do 3 mug bets for each free bet! Surely this would erode profits, I thought! I guess it will, but that’s better than being gubbed and losing the opportunity to have free bets. The 3:1 ratio is a little outdated now John, and I’ll be updating this post when I get chance! I would say focus on looking like a punter through silly bets and value rather than just taking 3 close matches for each 1 free bet. Thanks for that Luke. My current aim is to do potentially losing bets with the bookies in the hope that they will take me as a mug punter who is mostly losing and want to keep my account! I aim to get my returns from the matched bet with Betfair and count on the bookies as a fail-safe for the hopefully infrequent times when I don’t lose. I’ve found deliberately losing is easier said than done when doing the match odds, so I’m looking for bets for which I’m more likely to lose. Forecasting the final score at half time (2-0, 0-0,0-1 etc) is my latest idea. Making such a forecast before kick-off might be better, but I’d probably find it hard to provide the funds needed in Betfair to cover the liability arising from the high odds offered for such bets . yes totally understand gubbing, getting flagged for just taking free bets, how to avoid by taking the odd mug bet. Just started looking into matched betting with the initial sign up offers. One large bookmaker I signed up with, did an initial bet, claimed my free bet and also did that one. Nothing else done on the account and after a few days I get an e-mail saying that I’ve been both excluded from future promotions and been limited on future betting, and that this decision cannot be reversed under any circumstances. This seems extreme overkill to me having not taken advantage of any other offers or promotions with this bookmaker, and on top of everything else I lost both initial bets at the bookmaker. How could I have avoided this fate? Certainly not normal to have been gubbed so quickly, did you do anything that could have made you stand out? Well, I guess you must have done, but let’s try to narrow down what it was so it’s not repeated. Did you take a high-odds close match free bet on horse racing? Did you take an arb on the qualifying bet, the free bet, both? Hi Luke and thank you for reply. I’ve just been looking at my history on the site. The offer was bet £10 get £40. I started by depositing £20 (rather than £10). I notice under my transactions there is first a cancelled deposit from my card, and then an accepted deposit from my card. I also remember this one now as the offer was for 4x £10 bets with one of those to be used on a specific game and another to be used only from a mobile device. There was supposed to be a field or similar to activate the offer on first deposit but I was unable to do so as it was greyed out or something similar. This was my first cancelled deposit as I could not select the offer. I needed to contact their support and ask about this, who told me it was a small error that a few people were experiencing. They said to go ahead and place my deposit, then make my bet, then contact them again to ask for the free bets to be added. Next I placed a £20 bet BTTS yes (again double the requirement for the promotion) on an SPL match that evening (I was doing all this during the morning). It was a Celtic match so one of the big boys up that way. After this I contacted their support as instructed. They gave me the 4x £10 free bets, but these were good to bet on any event from any device (they told me they could not add the specific free bets from support). Finally I used all the free bets on a Copa Brasil game that night Over 4.5 goals. I suspect my interactions with support and the fact I received non-standard free bets may have come into play here, but I was given no other option due to their site not functioning correctly. My initial thoughts are those are reasonably niche betting markets, particularly the latter. Celtic are big but they don’t get much volume bet on their games really. Why did you bet on that Brazilian selection? I’m assuming it was a very close match/arb, that has to be it, right? If so, this would be an even easier thing to identify. I would definitely try to stick to lower % bets and much more high profile games; Premier League, La Liga, Champions League, and stick to higher profile markets too such as the win-draw-win market. * Qualifying bet I look for something between 2.0 and 3.0. * Free bet I look for something between 5.0 and 6.0 (trying to lose at the bookmakers and win at the Exchange as I prefer to try and keep the money in one place as much as possible). I always place my bets on football (as it’s something I’m fairly confident about, unlike some other popular sports). The reason for the Brazilian match was simply because there was little football on that day and I was looking for something available that day so I could move onto another offer the next day. Funny thing is as a ‘sweetener’ as part of the limiting my account they still gave me 2x £5 free bets ‘in case I was currently working toward any promotions’. So I’m not planning to matched bet that, but simply put it on a couple of longish odds bets in the hope I’ll win because it would cheer me up a bit to take a little out of their coffers. One thing I’ve not been clear on with regards to avoiding gubbing is…when is the optimal time to withdraw funds from your account? I understand that conventional wisdom says that you should avoid withdrawing as soon as you’ve used your free bet (for obvious reasons) and should look to do some mug betting first. However, by the same token, won’t it also look suspicious if you take a long time to withdraw and wait until you have hundreds of pounds in your account? How do you balance these two considerations and when would you say the optimal period to withdraw is? The main thing for me is that an algorithm can (and does) easily flag accounts that do a sign up offer then withdraw and never return/only return when there’s an offer. So as long as you make sure you beat that algorithm, you’re already doing more than many others do. Wow thanks for the advice here. I especially like the advice of trying to win on the lay bets. Because it should stop us from getting grubbed. As the bets are matched by other punters rather than the company itself.